Lady Sonya Longley, President: Thank you for attending this event today. The Bahamas Sickle Cell Association would like to announce its plans for this Sickle Cell Awareness Month which is celebrated worldwide. We believe that in order to get the needed support we have to make the opportunities to tell our story. This is such an opportunity. My name is Lady Sonya Longley and I am the President of the Association. Today our Officers, Directors and Members will share information about Sickle Cell Disease, the Association itself and the scheduled activities. One of our activities will be putting poster boards in schools that will assist educators and children with information about SCD. We will also have our first visit to the out islands during this Sickle Cell Awareness month. We have selected Freeport mainly because the demographics support our choice. We are committed to visiting all islands of the Bahamas so that our Registry is as up to date as possible. In this way we would be able to touch and feel most persons affected by SCD. I would like to introduce the Board of Directors and Members that are supporting us today. 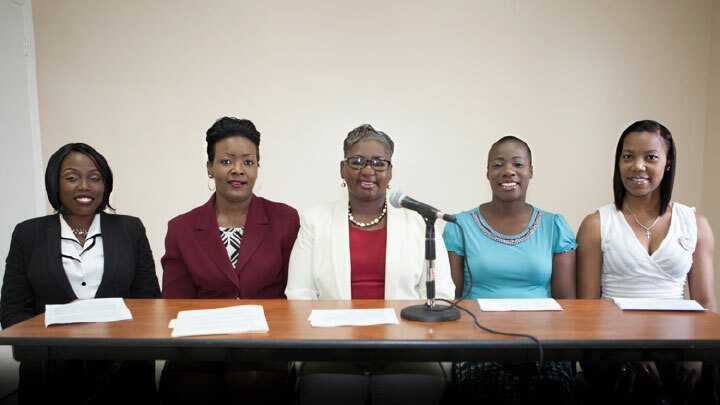 Vanessa Miller is our Vice President, LaTonya Bonimy is the Secretary, Our directors are Dana McKenzie and Danielle Ferguson our members include Tamara Clarke and Linda Evans. We are all personally affected by Sickle Cell Disease in one way or another. I will ask Vanessa to speak about the history of the association. Vanessa Miller, Vice-President: The Association was founded in 1981 by Dr. Patrick Roberts and a group of civic-minded individuals, some of whom were personally affected by the disease. To his credit, he noticed that there was a lack of education in society as a whole, additionally in his own practice and in the public hospital there was an alarming rate of babies being born with the disease. BSCA was formed to increase public education and awareness of sickle cell disease in the Bahamas and to lessen the effects of its impact on those with the disease. By 1979 BSCA was holding clinics, secured the services of a noted hematologist, psychiatrist, phycologist, social workers and volunteers to assist with the testing and treatment of sickle cell in the Bahamas. By the 1990’s due to the fact that most persons were regularly being tested and a general lack of continued interest and support for the goals of the association, the activities of BSCA were discontinued. In March of 2015, under the renewed interest of Dr.Nisha Armbrister,our immediate Past President, Dr. Patrick Roberts and several others personally affected by the disease, the association was revived. It is important to note that the charter of 1981 is still very relevant for today. In one year BSCA has grown to a membership of over thirty persons. Danielle Ferguson, Director: Sickle cell disease (SCD) is a severe blood disorder that affects hemoglobin, the protein found in red blood cells that help carry oxygen throughout the body. Sickle cell anemia occurs when a person inherits two abnormal genes (one from each parent) that cause their red blood cells to change shape. Normally cells are smooth and disc-shaped, these cells are more stiff and curved in the shape of a crescent moon or the old farm tool known as a sickle — that's where the disease gets its name. Instead of moving through the bloodstream easily, these sickle-shaped cells are not flexible and can stick to vessel walls, causing a blockage that slows or stops the flow of blood. When this happens, oxygen can’t reach nearby tissues. The lack of oxygenated tissue can cause attacks of sudden, severe pain, called pain crises. These pain attacks can occur without warning, and a person often needs to go to the hospital for effective treatment. BSCA is making a difference with hosting educational forums and assisting persons economically and emotionally. Tamara Clarke, Member: My son was diagnosed with the Sickle Cell Disease - SC in 2009. Some of the challenges he is faced with daily include: Being painful after swimming in salt water, being painful if he gets dehydrated and having a lot of nose bleeds after being too hot. In spite of Preston Clarke Jr.having the Sickle Cell Disease - SC he is very active and has been involved in Baseball for the past eight years, track and field for ayear and Basketball during the summers only.I am very grateful for the Bahamas Sickle Cell Association for helping me to get a better understanding about the Sickle Cell Disease / Trait and how it can be managed. I appreciate the Bahamas Sickle Cell Association and thank them for getting the message out there for persons who need to know. 1) Provide leadership on a national level to create awareness in all circles of the negative impact of sickle cell anemia on the health, economic, social and educational well-being of the individual and his/her family, and to create awareness of the requirements for resolution. 2) Prepare and distribute substantive, educational, materials, written and visual about the sickle cell problem for all relevant segments of our society. 4) Provide economic assistance and care packages to families who require operations locally and for those persons who pursue bone marrow transplants abroad; which is the only known cure for this disease. For 2016 the Association has already donated nearly $4,000 and our upcoming activities will assist with future goals. "The Bahamas Sickle Cell Association is dedicated to advocating and encouraging continued research for a cure for Sickle Cell Disease while working to enhance the quality of healthcare, life and services for individuals and families affected by this disease." Danielle Ferguson, Director: We are pleased that we are able to be here today to share our events to commemorate this Sickle Cell Awareness Month. First of all we thank Doctors Hospital for hosting our 3rd educational Forum for the year, the rebroadcasting of “A Deeper Look into Sickle Cell Disease” is being aired during this Month. - On September 3rd We partnered with Freedom Kids a Cancer Society Group for children who suffer from SCD and Cancer, we participated in the uplifting activities including craft and games BSCA look forward to being a constant part of this group that has been in existence for 5 years and we thank Melissa for the invitation. - September 10th – our FUN, RUN WALK under the theme “let’s break the sickle cycle” will take place at 6am from Goodman’s Bay to Sandyport and Back, this year we have Coke as a major sponsor and assistance from Bahamas Association of Compliance Officers. The donation to participate - $20 our aim is for 200 participants. - We are going to Freeport in order to host a Meet and Greet on Friday, September 16 at 7:30pm Grand Bahama Family Worship Center, West Atlantic Drive & Adventurer’s Way. - On Saturday September 17th at 6am we will host a FUN RUN WALK from the International Bazaar to the Airport and back. Participation cost $20 our aim is for 100 participants. Sonya Longley, President: It is my hope that you were able to get a better understanding of BSCA and SCD. For persons living with this disease there is economic hardship. Insurance is non-existent or prohibitive due to the pre-existing nature of the disease. Portable oxygen machines are costly approx. $3,000 each. The medication for pain is also very scarce and costly, there is really one main medication (hydroxyurea) that is thought to be effective against crises. There are also painkillers that should be used however there can be a fear of addiction therefore it may not be widely available in pharmacies. We would like the support of the general public in helping us to achieve our goals and for you the media to assist us in getting the word out on our activities which will benefit persons living with SCD.